It's odd. You'd think making games as a hobby is fun and relaxing, but OCD and stress combined with some difficulties in porting conspired to leave me exhausted to the point of physical illness. But I guess it's all worth it in the end, because you can at last play Glittering Light in your browser, either here on No Time To Play, or else over on Itch.io. 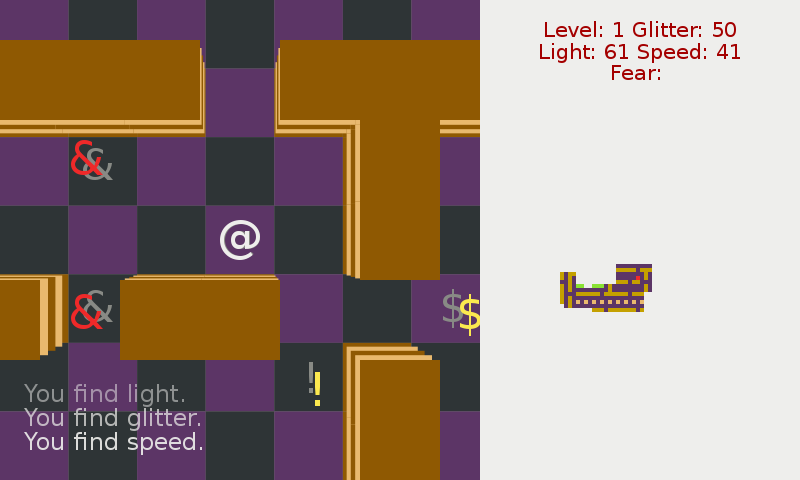 It's unfinished, mind you -- for such a simple game it caused a ton of technical issues. But it's playable, and the rest is coming along. Thank you for your patience. And now for the week's news. After a too-long hiatus, SPAG magazine #62 is finally out! It's a rather thin issue, likely because they spent some content on the preview a couple of months ago. I was pleasantly surprised to find an article inside about the parallels between videogames and improv -- something I'd been thinking of lately. Still on the topic of interactive fiction, Emily Short writes about the ramifications of implementing story and puzzles in an inherently multiplayer setup. I guess there's a reason why quests in MMORPGs are essentially single-player, and each player experiences the story as if they were the only hero. It's not only for players to feel like heroes, as it turns out: the alternative would just be too hard. Doubly so if you don't have a world-class expert designing your quests. Also in the way of postmortems, we have the story of someone who wrote a NES emulator and learned some intriguing details about the venerable machine. And since I mentioned the NES, here's an opinion piece about the ways Dark Souls is like a NES game. But don't let that fool you: it's not so much about Dark Souls or the NES as it is about player agency and the sacrifices we make in the name of realism. Last but not least, I spotted an interview with Tim Schafer, in The Guardian of all places, and the author of PuzzleScript came up with another fun little toy for making simple point and click games. So, not a bad week in the way of gaming news. Here's to the next one.